Batman: Detective Comics (Rebirth) Vol. 4: Deus Ex Machina by James Tynion IV (Illustrated by Alvaro Martinez) continues the story centering around Batman training a team to fight with. This graphic novel collects Detective Comics #957-962. Batman: Detective Comics (Rebirth) Vol. 4: Deus Ex Machina by James Tynion, IV (Illustrated by Alvaro Martinez) is a solid book of the Detective Comics series. 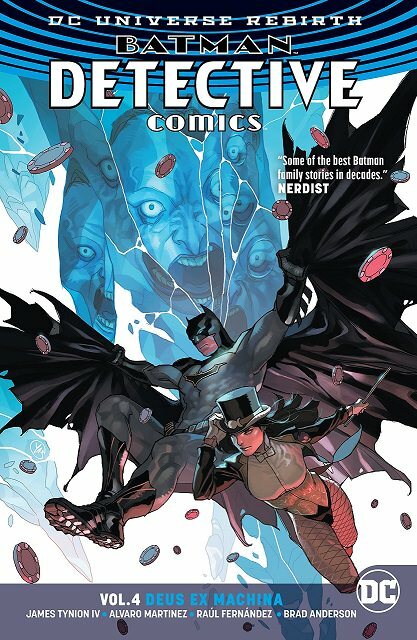 Batman (Bruce Wayne) teams up with Zatanna, the magician, and the reader gets to view a bit of their history. This graphic novel has two parallel story-lines, one dealing with Zatanna, the other with Azrael (Jean Paul). As one can see, this book was big on magic and the occult which frankly worked and I thought was an interesting addition to the Rebirth series. The art in this graphic novel was strong, I enjoyed it (not as much as the artist enjoyed working on Zatanna), and it certainly enhanced the story and did not distract. This is the first graphic novel which in found Zatanna interesting and would not be against seeing more of this incarnation in future DC books. This is another solid edition to the series. I find that every time I open one of these issues I’m afraid it’s going to ruin the series. Sadly this is from past experience. Not the Rebirth series though. Every issue is strong and addictive. Batman finds out that with more people on his team, there are more targets opportunities for his enemies. Together with Azrael, a former assassin, the team finds themselves as targets for a deadly artificial intelligence known as Ascalon. In order to fight Ascalon, Bruce Wayne joins with Zatanna to find The God Machine. In their adventures they encounter Ra’s al Ghul and Azrael.